Compulsory tips to drivers & guides (EUR 3 per person per day). Meals, coach tours, transfers, entrance fees, excursions, sightseeing and surface transportation as mentioned in the itinerary. Professional services of a Tour Manager (Provided there are over 35 adult passengers travelling on the tour) or Local Representative. Belgium, a country in Western Europe, is known for medieval towns, Renaissance architecture and as headquarters of the European Union and NATO. The country has distinctive regions including Dutch-speaking Flanders to the north, French-speaking Wallonia to the south and a German-speaking community to the east. The bilingual capital, Brussels, has ornateguildhalls at Grand-Place and elegant art-nouveau buildings. The Netherlands, a country in northwestern Europe, is known for a flat landscape of canals, tulip fields, windmills and cycling routes. Amsterdam, the capital, is home to the Rijksmuseum, Van Gogh Museum and the house where Jewish diarist Anne Frank hid during WWII. Liechtenstein is a German-speaking, 25km-long principality between Austria and Switzerland. It’s known for its medieval castles, alpine landscapes and villages linked by a network of trails. •	Today marks the beginning of what will assumably be a great and memorable holiday our “European Masterpiece” tour. We arrive at the London airport where, after immigration clearance, we will be escorted to our hotel (Check In at 1600 Hours) by our representative. We take some time to settle into our rooms and relax for a bit before heading to an Indian restaurant for dinner. •	We have the day at leisure as we give sightseeing a miss for today to recover from the long flight. •	Well rested and well stuffed with a wholesome breakfast as we are, we kickstart our London visit with a guided tour of the city that takes us past all the memorable monuments and structures of the town including popular attractions such as the Hyde Park, the Piccadily Circus, the Trafalgar Square, Big Ben, the Houses of Parliament, the Westminster Abbey, the Buckingham Palace (also witness the Change of Guard ceremony at the palace depending on operational technicalities), the London Bridge, the Tower Bridge, etc. •	Next on our list is another popular London attraction, the London Eye. 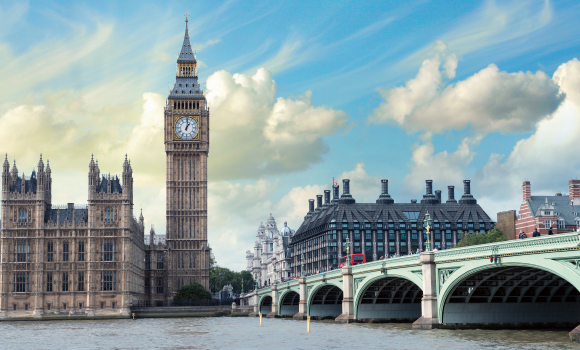 While the guided tour offers close-up views of the architectural monuments, the giant wheel that is the London Eye, offers a spectacular bird’s eye view of the town and it’s monumental structures like the Houses of Parliament, Buckingham Palace, St Paul's Cathedral, the Gherkin, the Shard, etc. and the adjoining River Thames. The 30-minute ride ensures that you get your fill of London’s cityscape while the climate-controlled capsules warrant a comfortable ride. •	We then head on to the Oxford Street because, obviously, our trip to London would be incomplete without a shopping excursion at England’s hottest shopping street. •	We then grab our dinner and head back to our hotel to get a good night’s sleep. •	Day 3 of our trip is going to be the only star-studded day of the trip and we obviously don’t want to be late for our meet-n-greet with the stars. So, we quickly chow down our breakfast and head to the Madame Tussaud's Wax Museum. With 14 interactive zones and over 300 life-like wax figures, you are sure to find yourself entrapped in the world of stardom. You could sip on a cup of tea with Her Majesty the Queen, join the Royals at the Royal Balcony, embark upon an intergalactic journey with the Star Wars setup, strike a pose with Hollywood bigwigs, click selfies with sports legends and a lot more. •	After this heady experience, we make our way to Saint Pancras station and board our train, Euro Star (Europe’s fastest train that takes us past some of the most scenic stretches of UK and France) to Paris Gare du Nord. Once in the French capital, we proceed to check into our hotel in Paris and head out for dinner after a short resting break. •	From here, we can either head to the hotel or continue to enjoy the optional “Paris by Night” Tour, a truly wonderful experience that makes it apparent why Paris is called the City of Lights, and the optional Lido Show performed by the popular Parisian Cabaret. •	There can’t be a Paris trip without spending a day revelling in the wonders of Disneyland, Paris. So, our schedule for the day comprises having as much fun as possible at this deservingly popular amusement park. No matter what your reservation might be about spending several hours at the Disneyland, Paris, the one thing that’s pre-guaranteed is that you will end up having a great, great day (age no bar, gender no bar). •	Divided into four themed lands, the park has something for everyone- age no bar, gender no bar. From screaming your lungs off on monstrous rides like Space Mountain Mission 2 or Indiana Jones to smiling broadly through bearable rides as It’s A Small World to meeting and taking selfies with your favourite cartoon characters to entering fantasy set-ups like Pirates of the Caribbean or the Mad Hatter’s Tea Cups to that of enjoying the parade, there’s a lot to keep even the pickiest traveller entertained. And it isn’t just about the activities, but the thrill and excitement in the air further add to the magic of Disneyland. •	That said, if you are a cinema buff, you’d probably want to spend the day at the Walt Disney Studios, a place that brings the magic of cinema to life. You could enjoy a tram tour through the studio taking in views of life-like movie sets, props and even experience some dramatic effects. Then there are rides themed around movies that combine the stomach-churning ride movements with spectacular visual effects and, of course, the shows that are memorably entertaining. •	At some point during this fun-filled day, we also make time to eat up our packed lunch or use the meal voucher to make a purchase. •	Despite its popularity, if Disneyland, Paris is not something that interests you, you can skip the amusement park and instead go a more relaxed and luxurious excursion. You first visit the Palace of Versailles (now a museum) known to be one of the finest and plushest examples of Renaissance art in Paris. While the magnificent facade and the gigantic scale are proof enough of the grand lifestyle of the ancient French royals, the exotic decor and splendid artwork inside are further indicators of their refined aesthetic tastes. The Hall of Mirrors, the Grand Trianon, the Queen's Chamber, the Chapelle and the beautiful garden are some of the more popular areas of the palace. We then embark on another artistic journey to the past as we visit the Louvre Museum, the world's largest art museum with an extensive range of Greek and Roman sculptures, Egyptian antiques, painting and graphics by legendary artists and a lot more. While the impressive collection sure is the highlight of the museum, the majestic palace-turned-museum itself is a splendid piece of art. Admire the Monalisa painting, one of the greatest treasure in Louvre Museum. •	After this exhilarating yet tiring day, there’s nothing better than to feast upon a delicious dinner and nestle in our beds for a good night’s sleep. •	After breakfast today, we visit Montmartre is a district full of authentic charm, famous for the Sacré-Coeur basilica and a magnificent view of Paris. Take the funicular to the top of Montmartre hill. After visiting the basilica, visitors enjoy strolling around this historic area. •	Renowned for its romantic charms, its multi-layered character and its monumental beauty, Paris is hardly the place to need an introduction. Starting our guided city tour at the Trocadero Square, we continue to marvel at the architectural excellence of the city with structures such as the pyramid of the Louvre, Garnier's Opera (the largest opera theatre in the world), the Place de la Concorde (the site of the infamous guillotine) the Champs Élysées (one of the most fashionable streets in the world), the Napoleonic Arc de Triomphe, the Alexander Bridge and the Hotel des Invalides among others. •	Next we visit, city’s most iconic landmark, the Eiffel Tower. What earns this wrought iron lattice tower all its popularity is the sheer magnanimity of the structure that is known for the humbling effects it has on mere mortals. Then there is the panoramic city view that you get while atop the tower which we shall be visiting up to the second level. •	And while the on-road tour is certainly the key to getting the city’s real feel, it’s a whole different experience (both surreal and magical at the same time) to absorb in the city’s character while sailing on the Seine River. So, we take a cruise down the famous river that allows us to grab marvellous views of many Parisian highlights including the recently-visited Eiffel Tower, the Louvre, the Musée d’Orsay, Notre Dame, etc. •	We bring our day to a close by indulging ourselves in a yummy dinner and head straight to the hotel to wade off the day’s exhaustion. •	Bidding adieu to the French capital we move on to the Belgian capital, Brussels, a city that, in itself, would appear as a contemporary art gallery. Despite the long drive, the splendid natural views that run along the road ensure that we stay well entertained. Upon arrival in Brussels, we quickly head for lunch before we start exploring the town. We begin our Brussel voyage with a photo stop at the single most unique Belgian structure, The Atomium. Originally built in 1958 for the Brussels’ World Fair, the structure was retained, thanks to its architectural brilliance. Essentially, The Atomium is a giant iron crystal magnified 165 billion times its actual size. Accordingly, the structure consists of 9 spheres arranged to represent the atoms in an iron crystal. A visit to this metal monument sure is a humbling experience. •	Next, we head to the iconic Grand Place, known to be Europe’s most beautiful and buzzing square. This exquisite market square is the main tourist attraction of the city that has often left sightseers awestruck, thanks to the historic architectural marvels from the eras of Baroque, Gothic and Louis XIV that give the place and eclectic character. Visit Mannekin Pis, one of the famous statue and fountain, a mascot and the hero of many incredible tales. •	Bringing the day to a close, we proceed to Eindhoven, relish a delicious dinner and check into our hotel. •	After breakfast today, we begin with our Netherlands exploration starting at the very beautiful Keukenhof Garden in Lisse. Planted over an expanse of 79 acres, the garden is a colourful sea of 800 varieties of Tulips and other spring flowers. Interspersed between these floral fields are other beautifying attractions including canals, a windmill, artistic floral displays and flower shows among others. •	Alternatively, in months when the Keukenhof Garden is off limits, we make a visit to another equally beautiful yet strikingly unique park… the Madurodam Miniature Park, The Hague. As can easily be guessed from the name itself, the park houses miniature versions of several Dutch architectural landmarks, traditional Dutch houses, canals, parks, windmills, verdant fields and a lot more. What brings this miniature park to life is the addition of human figures that not only give character to this miniature world but also depicts the evolution of Dutch lifestyle over the years. •	From here we head to the capital to keep up with our Amsterdam schedule making yet another pit stop at the famous Cheese Farm & Clog Shoe Factory to learn about the art of traditional cheese-making and also of the famous Dutch clogs. •	Thereafter, we drive along the scenic scenes of Netherlands to arrive in Amsterdam where a delicious Indian lunch awaits us. We then begin our Amsterdam tour with the busiest town centre, the Dam Square or simply The Dam. From memorable monuments and statues to souvenir shops and restaurants to that of scores of pigeons and buskers, The Dam is a true reflection of the city’s character. And because Amsterdam is nothing without its spectacular canal circuit, we then get on a glass-topped cruise to navigate through this picturesque town with its regal mansions and houseboats and bridges via its impressive canal ring, which is now a UNESCO World Heritage site in itself. A cruise on this canal ring somehow makes everything about Amsterdam even more surreal. •	As the clock inches closer to dinner time, we proceed to Eindhoven / Antwerp to stuff ourselves with a wonderful meal at a restaurant and head back to our hotel. •	Today, we embrace ourselves to be inspired by the scenic natural beauty and cityscapes of Germany. First stop: Cologne! Here we head straight for the building that dominates the skyline of this German Town… The Cologne Cathedral, also a UNESCO World Heritage Site. Though the intrinsic architectural beauty and its magnanimity are the striking characteristics of this Gothic structure, there’s something far more impressive about it than just the architectural brilliance. •	So, the Cathedral was built in parts over 7 centuries (started in 1248 and completed in 1880). Naturally then it shifted builders throughout its construction. And yet the Cathedral stands in complete aesthetic harmony unifying the distinct flavours of every builder and every century. We take some time here to absorb in all the artistic masterpieces the Cathedral has to offer before heading out for lunch at an Indian restaurant. •	We then proceed to Boppard from where we embark on a cruise to St. Goar cruising on the Rhine River. 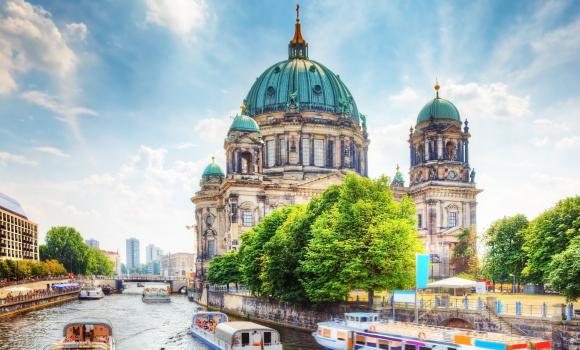 The cruise allows you to witness the charm of medieval ages with a striking stamp of German history. Apart from the fortress and other architectural attractions, the cruise also offers some of the most splendid views of the Rhine Valley. •	We then continue to drive along the mesmerizing German views to Heidelberg. Heidelberg comes as a welcome change with its rich cultural and architectural heritage that the city has retained since the 18th century. The most iconic among these architectural merits is the romantic Heidelberg castle. We then take some time to walk around, Alstadt, taking in the aesthetic beauty of this old section of the town that comes in the form of uniformly Baroque architecture. Here we make a pit stop for a delectable Indian dinner before checking into our hotel for the night. Good bye Germany! Swiss lands, here we come! •	The thing about long drives is that they often tend to be tiring. It’s a good thing then that we have panoramic stretches of meadows, mountains, fields and rivers to keep our minds and bodies refreshed. After breakfast today, we leave for Switzerland making a pit stop in the Black Forest where we get to witness a demonstration of the traditional cuckoo clock. •	We then grab our lunch and move on to Switzerland along the picturesque road with the mountainous forest as a backdrop and arrive at the Rhine Fall, the largest waterfall in Europe. Though the fall might appear stunted at 23 meters, as compared to other higher waterfalls in Switzerland, the magnanimity and might of the Rhine is palpable from the sheer force with which it paves its way through the rocks, something we experience as we take a boat ride to this spectacular fall. •	With absolutely no time to waste, we immediately start off with our orientation tour of Zurich moving past the city’s fanciest shopping street, Bahnhofstrasse. We continue to marvel at the town’s artistic expertise as we pass the elegant copper spire of the Fraumunster found in the 9th Century with its impressive stained glass windows. We then pause for a quick photo stop at the Zurich Lake. •	After a satisfying dinner, we check into our hotel and hit the bed. •	If you are tired from all the roaming around we’ve been doing for the past few days, today is your chance to take a step back and relax. You have the day at your leisure to simply laze around in the hotel or explore the beautiful neighbourhood. If, however, you are one of those who believes in not wasting a single day while on a holiday, you can choose to be on top of the world, or literally on top of Europe, with the exciting optional trip to the winter wonderland, Jungfraujoch. What makes this eternal ice-land a quintessential Swiss travel destination is the fact that the enthralling experience begins from the moment you board the cogwheel train which ascends you to Europe’s highest station, Jungfraujoch (at 3454m), with breathtaking views of bright ice and dark tunnels. Awaiting us on the other side of this exhilarating and cold journey to the top is a lineup of activities. But before that, let’s just curb that hunger with a piping hot Indian lunch. •	We move on to our ice excursion here on with a walk on the great Aletsch Glacier (the longest ice stream in the Alps), a visit to the glistening Ice Palace, a visit to the Sphinx Observation Terrace (the loftiest point of all) and more. •	After the ice-cold adventure, we descend to something more soothing and far more green, the city of Interlaken, which, as the name suggests, is cradled cosily between the beautiful lakes of Brienz and Thun. Here is where you receive your first retail therapy while enjoying the marvels of Swiss shopping at a market that boasts as much of pocket-friendly souvenirs as that of high-end watches and jewellery. •	We head to an Indian restaurant for dinner, before heading back to the hotel to relax and re-energise ourselves for the next day. •	It’s time to experience the winter white sceneries and freezing temperatures yet again as we head for the Glacier 3000 after breakfast today. Apart from the incredibly spectacular views of snow-laced peaks all around, Glacier 3000 also offers a wide array of activities. From enjoying the winter views during the cable-car ride to and from Les Diablerets to skiing and hiking to the thrilling snow-bus ride to that of the Peak Walk on the world’s only suspension bridge connecting two peaks, there’s something for everybody here. And because nothing brings more warmth to our minds and bodies than a steamy meal, we enjoy a delicious lunch at Glacier 3000 before heading back to Les Diablerets. •	We then continue to journey through the blissful natural beauty the Swiss lands have to offer to reach a city that perfectly fits the bill for a cliched romantic Swiss destination. Enter: Lucerne! With no time to waste, we start off our orientation tour exploring the picturesque mountains, lakes, cowbells, alpine villages and meadows, the poignant Lion Monument, the covered, wooden Kapellbrücke (chapel bridge) and the ornate Jesuit Church. Bringing some relief to the compulsive shopper, we also spend some time here to load ourselves with Swiss souvenirs. •	Today, after breakfast, we wave goodbye to Switzerland and take our expedition further to yet another country that’s effortlessly balanced between architectural marvels and natural landscapes… Austria. But first, we must make a short stop at the Liechtenstein capital, Vaduz. With a backdrop of mountains and the Rhine River, Vaduz is a tiny town that offers ample visual beauty. The car-free town with its tasteful blend of modern, Gothic and Baroque architectural structures and a crown-like castle on the peak overlooking the town, Vaduz is stunning in every aspect. We take some time to explore this beautiful time, have a sumptuous lunch and proceed to our next destination… Wattens, Austria. •	Here we embark upon what’s truly the most dazzling experience of our life as we visit the renowned museum, Swarovski Crystal Worlds. While the giant head, or simply The Giant, with water pouring out of its mouth is what pops in our heads when talking about the crystal museum, what greets us inside the Chambers of Wonder is a whole new world of sparkling crystals of varied sizes ranging from the smallest to the largest in the world. These twinkling stones are grouped together to make 16 distinct artistic installations, each designed by a different artist and each with the capability of leaving us in a stunned silence. Our sparkly tour ends at the Swarovski showroom where you can bag a few of these shining gems. •	A short drive further is our next and final stop for the day, the city of Innsbruck where we begin with the orientation tour without wasting any time upon arrival. Settled in the heart of the Austrian Alps, the mountains make for a dramatic backdrop for the city while the pastel-hued houses lining the banks of the green-watered River Inn add to the city’s aesthetic beauty. After having taken in our share of the surrounding natural beauty, we continue our tour wandering past The Golden Roof or the Goldenes Dachl- an ornate Gothic balcony erected by Emperor Maximilian I in the 15th century, the Imperial Church and the Hofburg or the Imperial Palace. •	Though the scenic scenes of Switzerland and Austria aren’t something you ever tire of, it’s now time to plunge into the world of art and religious history as we make our way into Italy. If you ever fancied time travel, today would be the closest you come to living up to your fantasy as we head for the City of Canals (and also palaces), Venice. With its appearance virtually unchanged for the last 600 years, Venice is more a city out of a typical fairy-tale than a modern-day metropolis. •	We check out of our hotel after breakfast and drive to Tronchetto. Here we board a cruise to glide romantically past dreamy palaces, through incredible miniature canals to the Piazza San Marco (St. Mark's Square), dubbed as the ‘finest drawing room in Europe’ by Napoleon, courtesy of the forever carnival-like vibe it gave off. With it being the only public Square in the city, Napoleon’s phrase is still an apt description for the Square. Here is the popular St. Mark’s Basilica. Standing next to this Byzantine-style basilica is the Gothic-style Doge’s Palace. Now a museum, the palace houses some of the finest examples of the ionic Murano glass and also of Venetian art. •	We also make a visit to the famous Murano Glass Showroom (When Open) to get a glimpse of the glass-blowing process of this iconic ancient Venetian craft that ranges from sculptures to vases to bowls to jewellery. And because these beautiful pieces are so hard to resist, you can even purchase a few collectables. Hereafter, we go on yet another water voyage with the Gondola ride along the Bridge of Sighs that connects the Doge’s Palace at the square to its prison. •	Contended with our day’s expedition, we begin our return journey to Tronchetto by boat where we will be served a delicious dinner. We then check into our hotel in Padova to finish off our day. •	It’s kind of an unwritten mandate that you ought to see the architectural marvel that is The Leaning Tower in Pisa while touring through Italy. So, we kickstart our day with a visit to Pisa’s wondrous Square of Miracles with its exemplary Pisan-Romanesque architectural structures- the Baptistery, the Cathedral and the leaning Bell Tower, the characteristic tilt of which is what marks this Square as unique. •	We then drive through a picturesque stretch of olive groves and vineyards to Florence, a shrine to the wonders of the Renaissance. Here, we begin our guided city tour to take in the beauty of the architectural treasures including the world’s fourth-largest Cathedral and Florence’s tallest building, the Duomo. The magnanimity of its scale juxtaposed with the beauty of its design gives this monument its overwhelming character. Standing beside this is the Florence Baptistery with its iconic ‘Gate to Paradise’- a pair of gilded bronze doors that have now become an icon of Renaissance art- and also the open-air gallery in the Signoria Square, the city’s oldest standing bridge, Ponte Vecchio and more. •	Bringing the day to an end, we proceed to our hotel in Arezzo where a delicious dinner is laid out for us before we finally call it a night. •	There couldn’t have been a better way to end our Europe exploration than a city of absolute ancient beauty and a mysterious opulence about it… Rome. After breakfast today, we drive to Rome enjoying the awe-inspiring landscapes and a comfort stop on the way. •	Once in Rome, we stuff ourselves with a sumptuous lunch and head to the smallest nation in the world that’s nestled within the very heart of Rome, The Vatican City. Call it home of the Pope or the Roman Catholic headquarters, the fact remains that you don’t really have to be a follower of either to appreciate the enormous beauty that scapes this tiny nation. Living proof of its rich cultural heritage are the monumental tributes to Renaissance art. There is the Vatican Museum, world’s largest museum complex that houses priceless treasures in the form of paintings, sculptures, tapestries and a variety of other depictions of Renaissance art). Next up is the Sistine Chapel famous for the Michelangelo ceiling. One look and you’ll know that this artistic masterpiece is worth all the buzz. And the last gem to be discovered at the Vatican City also happens to be one of the world’s largest churches, St. Peter’s Basilica, which houses the tomb of St. Peters under the high altar. •	Hereon begins our guided tour of the astounding ancient beauty that is the city of Rome. Be it the drive past the mighty triumphal Arch of Constantine or past the Circus Maxima- the biggest stadium in ancient Rome- or the drive through Piazza Venezia- a busy hub of the city- one can’t help but marvel over the sheer grandiose of Roman architecture. Further reminders of the same come our way as we pass by the Colosseum and the ruins of the Roman Forum. •	Our tour ends at the city’s most iconic pieces of art, the Trevi Fountain, which simply put is a dreamy and magical sight. What adds to the ethereal vibe of this magnanimous structure are the great examples of Baroque art- the sea-god Neptune, winged horses and allegorical figures. •	Exhilarated yet exhausted with the day’s share of artistic thrills, we proceed to a restaurant to enjoy the dinner and then check into our hotel in Rome. •	And just like that our fabulous journey of our “European Masterpiece tour” comes to an end, sooner than we would have liked. With our bags neatly packed and our souvenirs all stacked up, we enjoy one last breakfast on foreign lands. With wonderful memories of the trip and renewed plans of another visit. •	we head to the airport to board our flight back home. Breakfast will be continental which includes tea, coffee, cereal, juice, bread, butter. Any damages caused to the hotel rooms / Coach during your stay, shall be payable by the passengers. We do not guarantee air-conditioned hotels. Incase Minimum Operating Strength is not achieved this tour can be called off. Due to limited space for luggage on the coach we permit only one suitcase and one handbag per person in the coach. International check in time is 1400hrs and check out time is 1200hrs. (Early Check In and Late Check Out are subject to availability). Transfer other than Group transfer would be paid by the client directly. Hotel / Flights / Sightseeing timings are subject to change with / without prior notice. Tips, Laundry, Telephone, Porterage and any expenses of personal nature are not included.